I usually avoid unicorn "lore" because it tends to be soft and pappy. Most fiction involving unicorns also leaves a bad taste in my mouth. (Peter Beagle's The Last Unicorn excepted, of course.) Odell Shepard's The Lore of the Unicorn, 1930, however, is literally the most scholarly book i've ever read. Words like "research" or "academia" just don't fit the bill. It's undiluted scholarship going on here. Did you know that the King James Bible contains seven references to unicorns ? 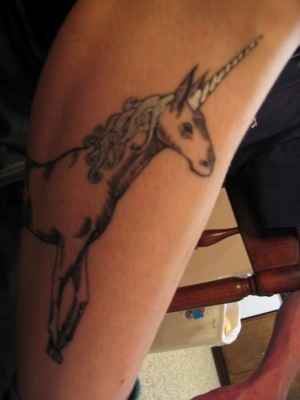 Or that just about every culture on earth has a mythical one-horned beast much like the unicorn ? Or that alicorn (unicorn horn) was commonly sold for ten times its weight in gold for several centuries during the middle ages ? Or how formally the classical story of the unicorn hunt (where a maiden lures the unicorn and then the huntsmen leap out and kill it) parallels the Christ myth ? - Shepard delves *exhaustively* into these topics and about a zillion others. However, be prepared for passages in French, Greek or Hebrew which carry actual substantive content and which are not translated. He assumes an education in letters, but even without one i thorougly enjoyed the book.